Trying to get a read on gold lately has been challenging to say the least. It has been up; it has been down; it has had some wild swings intraday and then sat there on other days. However, it has finally managed to end the week above the 50 day moving average. For you technical analysis geeks like myself out there, that is a significant accomplishment. 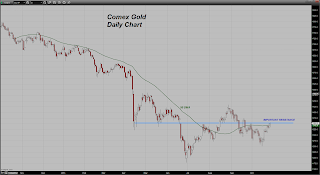 I discussed this with Eric King on this week's Metals Wrap over at KWN but I wanted to detail it the price chart as the visuals are more often conducive to making a point. The last time gold managed this feat (it was back in early August) the metal put on another $100 or so. That is not to say it is going to do so again but what happened as a result of this was that the hedge fund buy programs began to kick in. For whatever reason, market technicians have decided that markets closing above or below the 50 day moving average is a big deal, especially when they manage to do so on at least two consecutive days. If you look at the chart and go back into November of last year you can see that the metal had managed to push past the 50 day moving average up near $1740 or so. It then managed to keep its footing above this level but unfortunately FAILED TO EXTEND HIGHER the next two sessions. The initial breach was constructive but the inability to BUILD on that performance was disappointing. ON the third day after the breach of the 50 DMA, the market then failed to hold above this level and back down it went. From that point on, in both January and February, this moving average capped all further upside progress. It was not until July this year that the moving average came into play again. Notice the technical battle that occurred around this level that month. In early August, price once again cleared the 50 DMA. This time it managed to STAY ABOVE the average. Three days later, it took out the high of the day on which it first broke above this barrier. From that point on, the market rallied sharply until it ran out of steam up near $1430 or so. So where does that leave us this week? Answer - looking for the performance of the metal early next week. If the market can push past the high of Friday and close strong on Monday, it should begin to gather some upside steam as I believe we will see some shorts begin to exit as well as attract some fresh momentum based buying. If it sets back, we want to see it STAY ABOVE the 50 day moving average, at least on the CLOSE of the pit session. I should note here that Friday's high just so happened to reach right into a strong zone of resistance centered near $1350. That gives the performance of gold early next week even more significance. The bulls have managed to grasp the initiative in the market even if it is only a slight victory at this point. It is up to them to press their advantage at this juncture if they wish to cause some more discomfort for the shorts. If they can do so, $1375 should be an easy target for this initial push. Take it through there and they have a good chance to make a push to $1395- $1400. If the market fails to extend higher as stated above, then bulls will want to see the price stay above $1300. There is some light chart support first near $1320-$1316 and more down near $1305. I will say something else here that is important but is yet a good way's off. If gold were for some reason able to clear that spike high above $1425, it would be a TEXTBOOK CHART PATTERN of an important bottom. That would attract a major amount of buying which would set the market up for a run to $1480 - $1490. Again, that is a long way off but one can hope can they not? Let's see if the metal can even get a "14" handle on it before getting too carried away! 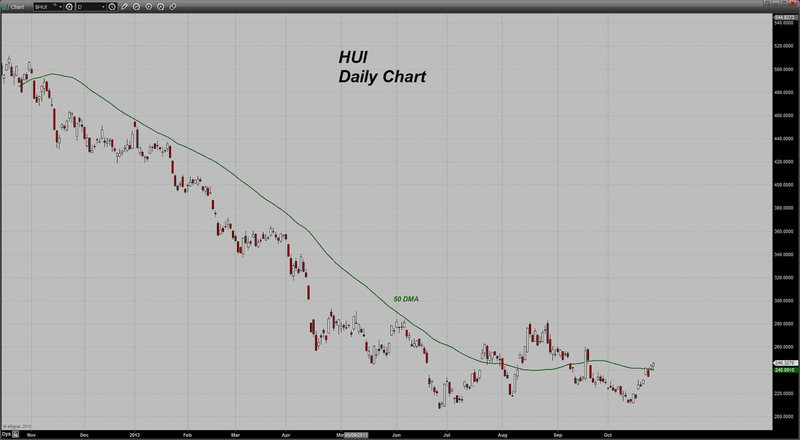 I want to note here that the HUI has also managed to claw its way back higher and is also perched above the 50 day moving average as well. that is a nice confirmation. Gold bulls never want to see the shares moving lower while the metal puts on some gains. I personally believe that the plight of the US Dollar is going to be what determines whether or not we see gold and the shares tacking on some additional upside. 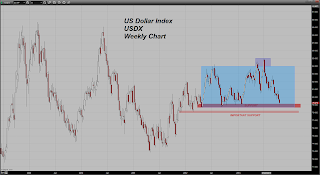 I noted earlier this week in a post that confidence in the US Dollar appeared to be waning based on its price action and the chart pattern. There seems to have been a shift in sentiment towards the greenback that came on the heels of the government shutdown and the resultant increase in the US borrowing limit. That was further compounded when with one voice the various FOMC governors, even the usual hawks among that group, were signaling that any bond buying tapering was off the table for the rest of the year at a bare minimum. Subsequent weak economic data confirmed that in the minds of trader and as it did, more selling hit the US Dollar. If you look at the following price chart, you can see the Dollar's recent woes in pictorial form. Notice how the price has been contained in a broad range since mid-March of LAST year. It did make a brief breakout above the range when the Fed was suddenly sounding hawkish on the QE bond taper caper this summer but once that came and went, back down into the range it went. This time however is it now plumbing the bottom of the range. As you can see, it has not been below the low of that range now over a year. If, and this is a BIG "IF", the dollar were to fail and fall through that low, it should continue until it falls to the next important level down near 78. If that were to give way, heaven help us all because all manner of chaos is going to break out in the commodity sector once again. It is going to be interesting if that occurs to see what the response of the Fed is going to be because odds are that the speculative crowd will start coming back blindly onto the long side of the commodity sector once again in anticipation of a wave of inflationary pressures related to the falling currency. Again, this is just a guess at this time as I have no way of knowing whether or not the Dollar is indeed going to fail to hold at support. I am merely laying out scenarios that we could see if it does. This is the biggest problem that I see with this unending madness known as QE. It lays the groundwork for the undermining of any confidence in the Dollar and sets it on a course of weakness. I do not want to see the Dollar weaken as an American but with this idiocy being engaged in by the Fed, and especially with the choice of Yellen ( the Dove of Doves), it is difficult for me to envision a scenario in which the Dollar embarks on a strong bull move as long as the hawkish voices on the FOMC are silent. Keep in mind it was all the hawkish talk coming of the Fed this past summer that pushed the Dollar higher along with a rise in interest rates. Until that sort of thing re-emerges, what would be the factors that could drive the Dollar higher again? The only ones I see would be if there were a resurgence of issues related to sovereign debt back over in the Euro Zone again. Oh what a mess these meddling Central Bankers have created for us all. Heaven spare us from this plague of locusts! Has this become the new norm and are we now destined to see a perpetually rising Federal Reserve Balance Sheet (now approaching $4 TRILLION) for the rest of our lives? When does this end? I have said this many times before but it bears repeating - as a TRADER, I have to go with the swings and the shifting sentiment in the markets in order to survive and make a living but as a long term oriented investor and a concerned and deeply worried citizen, I also have to look at gold as the only insurance against these modern day alchemists known as Central Bankers. They are going to be the ruin of us all. As a TRADER in today's Central Bank ruled world, I wish you all the best. Unfortunately, insider info is far more important than ever. I feel a bit challenged on understanding the correlation between US$ and gold price. The reason I'm perplexed is that notwithstanding the many who see gold only going up as $ falls, if we go back to the beginning months of 2013 gold was $1650 or higher and silver was $31.50 or higher and US$ was a bit under 79. So what has happened. My only explanation is to agree with Eric Sprott and many others who point out specific occasions when gold was dumped in massive quantities in the wee hours of the morning. Some have indicated the fingerprints of JPM....but doesn't matter other than to say some entity has intervened in this supposedly free market. As some have pointed out, who would unload vast quantities of anything in the weakest part of the market other than to change price direction? If not for this reason then I don't get it. But I'm just a simple guy LOL. I truly believe this is all about protecting the US$ and encouraging the masses to stay away from gold and go to general US equities to show all is well in USA. I guess if I was tasked to devise a tactic to do the above I don't think I could do any better than just what they've done....scare the heck out of the sheeple on gold and paint a rosy picture on $ and equities. I mean, it has worked great hasn't it? With this level of support the hedgies are now content to continue to carpet bomb gold and get the algos working away to walk gold equity share price down, short/naked short and eventually pick up stock at bargain basement price. Hey, JMHO and I'm not a daily trader so not savvy like some others here but this is the picture I'm getting. Opinions? Excellent points Dan made about confidence in the $ being key. Seems to me like the China rating downgrade and their open hostility to US diminishing the value of China's $1.27 trillion in US paper investment has had a worldwide impact on the confidence Dan speaks of, but I'm still puzzled as to the correlation of $ value to current gold price when one compares this to situation 7 or 8 months ago when $ was same area as now but gold $300 higher. Just puzzled. It is not a perfect one for one inverse relation but more of a general one. If it were, then it would be very difficult for gold to rise when priced in other major currency terms. Still it is a close enough connection that it does tend to be something we need to monitor. I think the reason for this is because the US dollar still remains the world's reserve currency and as such the majority of reserves are still held in US dollar denominated assets. The entire global economic system is thus Dollar-centric. to me gold is the Anti-Dollar. That is why it must be discredited and that is why I do believe that the Central Banks of the West to manage its price. That being said, it has been hedge fund selling that has been knocking gold lower. While the Dollar was rising there was no need of the price management scheme. If the Dollar were to break through chart support and gold start rising higher, I would then look for the hedge funds to be back on the long side and the bullion banks to start their selling programs again to try to contain its price rise. Good points, Dan, and gold being the anti-dollar sure makes sense. Although I do see some instances of huge manipulation in the gold sector, I like your term of "manage" as a more descriptive term of the ongoing activity of central banks....of course they must manage their currency....particularly against this anti-dollar. I tend to give his point of view extra credence due to his past positions in senior US gov't position and connections he would still have with gov't. One of his points is that big too big to fail banks should have been allowed to go bankrupt as the derivatives they carry and huge gambles they've made over past several years will likely bankrupt the nation. I used to hold gold for price appreciation whereas now I hold it as my security blanket just in case the picture that's been painted turns out to be true. A pretty sad state of affairs that our collective leaders have led us to this point. as a retired army lt col, shot down over the ho chi minh trail, and now 71 years old, i find myself deeply touched by your patriotism, dan. thank you very much for your kind words and for your service to our nation. Yes, I have never been as worried for the fate of my nation as I am at this point. Everywhere I look I see the institutions that make up our society in the state of collapse. Our financial system is hopelessly corrupted with Fed policy designed solely to aid the banks and Wall Street at the expense of savers, retirees and those on fixed incomes attempting to be at some sort of peace as they enter their final years in this world. They have been thrown under the bus in order to keep the house of debt-ridden cards from collapsing. Our political institutions are corrupt; our media is corrupt and Hollywood and much of our entertainment industry is corrupt. If that were not bad enough, the idea of ethics, integrity, virtue and honor are now openly ridiculed and that which is sacred is mocked. Geez - I just ended up depressing myself even further. I think I will go and drown myself in some football games or watch the World Series and see if we get another wild ending like we did in last night's game. On the website - http://goldprice.org/ - I noticed the end of trading price being $1347.20. Does that lower price (than $1350) indicate that there might be a lower price on Monday. Or is trading so light during that period - it does not matter. Hi jm, Iimho think that a resistance is always defined by an area rather than a spot price. 1350 gives you a little margin up and down, depending on your time unit. On a daily time scale, that prices close at 1347 or 1353 is more or less the same, you are still in contact with the resistance area. 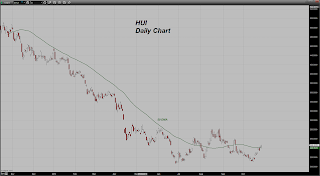 jmsvett - I agree with Hubert's thoughts... it is more a general level than a specific price point although I would not want to see gold drop down too much below that 50 day moving average and then get more downside follow through the following day were that to occur. I am of the opinion (at this point - ask me two days from now as that could all change again :o) - that there is beginning to be some shift in thinking among some in the investment community that with Yellen coming to replace Bernanke and with the US economy floundering on the rocks, that there might even be AN INCREASE in the size of the QE instead of a tapering. If that view were to take hold in a larger way, the Dollar would sink and gold would rise. I just am not sure right now what is coming next. The only thing that I am absolutely certain of is that the Central Bankers are going to ruin us all with this madness. It's always good to diversify. Very good remarks, Dan, I'm always listening, thanks a lot. 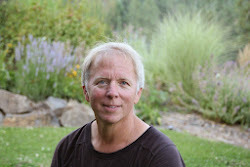 I also noted Bill Haynes : there are millions of potential investors out there who never thought about investing in gold, and most of his new orders this week came from newcomers, first time gold investors. "I also have to look at gold as the only insurance against these modern day alchemists known as Central Bankers." Very interesting focus on the ma50 indeed. I kind of forget this one easily. 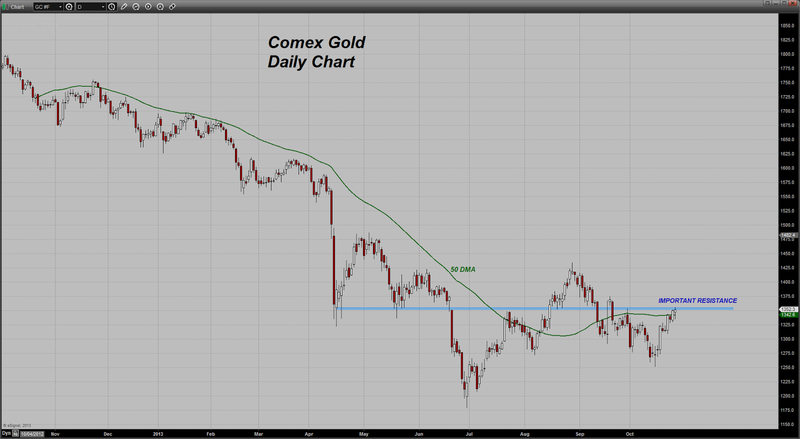 "If it sets back, we want to see it STAY ABOVE the 50 day moving average, at least on the CLOSE of the pit session." So maybe you just gave the hint of a possible long trade here with a close stop loss, not immediately in place, but an alert if prices drop below ma50 and a sell at the close if we remain under it. 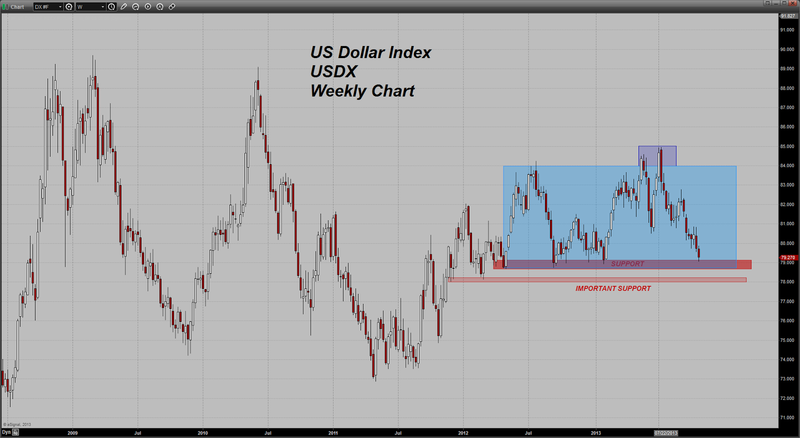 What makes me a bit nervous is indeed that the USD index is nearing some support level. Makes me Wonder if some CBs would decide to intervene in order to support the dollar. I'm no expert at all, but my feeling would be that for such important moves, they'll probably keep the powder dry for more important and critical levels such as 72. We saw the eurodollar starts to be a big trouble for one side or the other when it goes beyond 1,20 - 1,50 range. We are at 1,38 so there is still some margin here imho. Doesn't mean I'm right, of course, just means I stay long gold without being scared too much of a dollar bounce. If it should happen, anyway, my stop loss is here, no big deal. But yes, we are still in the resistance area, I've just added one line to your first chart here to show one more reason why it could still reverse next week. P.S : I reported the range of the 2 black lines in the chart below. It gives once more a target around 1420-1430. Anyhow, so I think I'll definitely try to play it, stick on my chair and target around 1420, latest highs if we break through friday's highs. I nearly strangled myself when I opened the monthly chart and watched where prices reversed up last week, because the pitchfork you see was of course there before, and of course the Bollinger. Why the hell didn't I monitor more carefully this time unit??? Focusing on daily / weekly, but careless about monthly. Big mistake, which cost me not to be part of the reverse up, despite the signs on the smaller time units. But here it is, big like a whale : the monthly time unit upwards pitchfork, and its glorious MLH INF, which nailed the bears attempts to crach prices towards 1200 again. Imho, as long as this beautiful MLH inf is here on the monthly time unit, it gives all the middle to long-term bull investors a nice support to rely on and a possibility to buy when we get close to it. The theoretical target is the black median, but...on the way is the median of the green pitchfork, around 1440 $ in november. Again, we are talking about the area of the last tops. 1412 in quarterly area is the middle of the body of the down ugly marubozu of Q1 2013. I expect strong headwinds just above 1400 with all those graphic résistances...but I hope we have enough fuel short term to reach that target. We'll see. I'm no specialist, just sharing my thoughts. Around the end of April 2011 and the beginning of May 2011 the Euro was around 149 U.S. Dollars. That is over two years ago.
" It’s now extremely doubtful that the Fed or DC will willingly cease the current Herculean efforts towards reviving this flawed practice of borrowing too much, too fast. So we have to expect that it will be some form of financial accident that finally breaks the stranglehold of failed thinking that infects current leadership." Others such as Stamps , coins etc. All less subject to manipulation. Very true - I am thinking more along the line of lead and guns! Thanks for the Sat update to complement your commentary on KWN. ( I am never what sure on KWNews what is hype --" end of the world as we know it stuff " -- versus the "real " news. The people buying gold in quantity are buying, because they think there will be a collapse, and are listening to the doomers. They saw what happened in the wake of the budget deal, and the upcoming future battles, and see the theoretical inflation potential left in its wake, and decide to now buy gold. There will be no extra inflation, and there will be no collapse, so what do these people do once the holiday season is over? If this rise happened in April-June I would be more sanguine, but it is happening at the strongest time of the year for gold. Central bankers are the worst market timers with respect to adding to gold. They sold all decade and switched to buying once it crossed 1300-1400 on the way up. Now they are holding back, except China. They know less about the gold markets than a savvy trader does. With much to do with respect to the agenda, I do not see how the globalists will let the dollar fall much further yet. All that needs to happen is for the FOMC to come out with a slightly hawkish statement and the dollar will be firmly above 81 with a couple days. The only real bullish thing I see is that according to the BPR the large domestic banks are adding COMEX longs. Actually, it's not the central banks, it's the govts selling and buying the gold. The act by consensus, and once that happens they time the market as the majority would time it - very poorly, and can viewed as a contrary indicatator. interesting action, watching the spoo and dow e-minis spike and gold drop. My dia and spy calls and mini dow future looks nice here. spoos hit all time high here. dow lagging. let's see if gold can pop it back up again here. My DIA and SPY calls should look good tomorrow. My DOW emini future looks nice overnight. Hate to open and old wound..but. Just reading on 321 about the Andrew Maguire debacle. Eric Sprott even defended him, now that is really really dumb. Is there anybody in the Gold world that is even remotely credible ? Nothing but a collection of two bit con men. I am just so very disappointed in myself for ever buying even one ounce based on the readings of some of these people. Only thing I can say in response, Dean,is can anyone believe anything Jeffrey Christian says on anything gold related? I mean he has advocated shorting gold for years now....hates gold. He often attends gold conferences to take the contrarian view. He's like that jon nadler guy kitco used to flaunt....like a gnat buzzing around your ear with little substance. Fair enough for Christian to have his point of view but gold has had a tremendous run during this period he was against gold. Just because a broken clock is right twice per day doesn't mean you can trust it. Eric Sprott has gone from a millionaire to a billionaire in the past 10 years that I've followed him so I tend to trust his judgement. I don't know Maquire so can't defend his bio. Hey, JMHO so not throwing rocks at anyone....well, maybe a small rock at Christian LOL. It's a tough world out there. Opinions and analysis taken on identical data are often so divergent that you would be hard pressed they were even referring to the same subject. Really hard to make sound investment decisions. "History indicates that loans will be reset to equal the depreciation in the dollar thereby leaving the debt at a similar value to what is was before the hyperinflation during the "Great Leveling," leading to the "Great Reset." The idea is that you will pay off your $50,000 mortgage with one maple leaf is historically fallacious." Interesting indeed. History indicates? Do we have examples? I think it happened that way in Argentina back in 2000, am I right? HdH-Would you include Weimar Germany? Solution to hyperinflation was Rentenmark which backed currency with land & industrial goods. It stands to reason that the mortgages would be revalued selectively to not give assets away? War has been used 100% of the time to reset financial systems. This case will be no different. Why do people refuse to see this? Because they cannot imagine that the globalists would allow a take-out offensive strike on their crown jewel - USA, Inc.
the great reset will be caused by a global thermonuclear war, limited in scope yet forever life changing. It is survivable as long as one lives away from the populated centers and corridors and stays healthy and out of debt. that won't be until the end of the decade at least. By then the globalists will have used their self-created monetary system to consolidate much of th world's wealth, and will own most of it by then. The bridge will be burned, then they will pose as our saviors, and introduce their dialectic answer, a one world financial system you will have to opt into voluntarily. they will own it and will own anyone who opts in. Until then the system can be kept afloat for years. There will be no debt reset, etc. the debt will be used to get us to this war and other side of it. There will be no hyperinflation. Too many people think this is the case, which is why gold has further to fall after the season is over. When assets are being inventoried by govt agencies, you have to conclude they are preparing for something, and that something is not hyperinflationary. How do you keep a global thermonuclear war limited in scope? Aside from radiations, what about nuclear winter effect? What kind of world would it look like afterwards? imho this would be a suicide for the globalists also. Plus the risk that they can't control at all the extent of the damage / nuclear strikes and don't keep anything "limited" at all. "Surgery" strikes are something one can consider when they talk about a tomahawk missile. But a surgery global nuclear war? Read Zbigniew Brzezinski's books the Grand Chessboard and Between Two Ages. Read what the globalists write and then you will understand what I am talking about. it is happening exactly as they discuss it. several thermonuclear battles will break out at the same time. one will be in the Korean Peninsula another will be with Pakistan and India. Toward the end of it China and Russia will perform on offensive nuclear strike against United States .I have already discussed this with you about the fallout be very limited in scope. the worst part will be the ostensible anarchy and loss of services. The globalists say that this will be the catalyst to get people to go along. I'm long half a "standard" long position, I don't buy more stop on the way up, my target is around 1400 + and stop loss not far from 1330. Position locked, too late to buy more after a jump of 100 $ already, I secured my potential loss with the stop. I don't move anymore until one or the other happen. no imagination here. just relaying to you how the "great reset" as many here discuss will take place. No collapse, no hyperinflation. No opinions, just relaying what the globalists talk about in books, presentations, and interviews. They control things. Plus, the upshot is that I take the time to read their imaginative stuff. Ask Detroit pensioners if they will bid up prices on consumables. Don't hold your breath. This will last a lot longer than the people here realize. Only when all the doomers are totally burned out and bankrupt, then they will be right. NSA reads the web and gets the lay of the land on how to trip up those who they think are anti-govt and anti-USFed. There are too many people crying collapse. It ain't gonna happen. spoos will touch 1800 next month. gold will maybe touch 1400, but of course, will fade again as no inflation comes to pass. I will then put a 100% hedge on physical then overweight my metal shorts then. spoos should touch 2100 sometime next spring. It's a sad farce, but that's what the momentum is saying. This will continue longer than most people will stay solvent. FOMC meeting tomorrow and Wednesday. My bet at this time is the Fed will suprises everyone and announce a small taper as the QE is not doing what they want it to anyway. The opposite of what eveyone expected last time. Those in the know are going short gold, at this point the Fed can't say anything dollar negative and take the chance of it falling through resistence. Just my thoughts. Perhaps. But some interesting dollar spurts today going into the meeting tomorrow. Maybe no taper annoucement coming but might also already be priced into gold. Like when gold ran from 1530 to 1790 in 2012, when the Fed announced more QE gold began to decline. Why? Because the market "somehow" already knew so it became a buy on the rumor and sell on the news. Gold is still not convincingly broken 1350. I am always here.. just in silence..
1st, i am shorting s&p from here onward no doubt in full strength... from here on i will stick to fundamental strength not the speculator asumption like I used to too. And will throw all the gov.t stimulus bet news away. 2nd, i am longing gold since last correction, i seeing some strength. ( of course i will book my profit on the way up). The market is getting disconnect and lot of thing don't sense. In the case i will rather used fundamental logic as my guidance. Baltic Dry Index rolling over pretty hard. It has been going almost straight up since Aug 2013. It was either going up due to inflation or due to economic activity. Now it is going down...anyone have any ideas on what's up? Maybe there's a U.N. RESOLUTION pending that will enact a partial trade embargo against the U.S.A. for all the NSA spying? It could be that the BRICS NATIONS are seriously considering dumping the dollar now and not only are they creating a NEW INTERNET CIRCUIT across the INDIAN and ATLANTIC OCEANS but maybe there's a mass exodus of these foreign shipping companies getting out of the U.S.A. boundary waters as plans are underway for a military operation on the U.S.A. by China and Russia. Wouldn't that be something if someone came and started launching missiles on places like the NSA SPY CENTER in Utah and other U.S.A. INTELLIGENCE CENTERS? Not everyone agrees with me but Snowden is a true patriot. We all have the right to know when our government breaks the law. The BDI is saying something...maybe...I'm not smart enough to figure it out. How the "great reset" will come about. Joel Skousen discusses this. Start viewing at about the 33rd minute, for the germane stuff on the "great reset" and how it will come about. We have plenty of time to prepare. "Toward the end of it China and Russia will perform on offensive nuclear strike against United States "
- do you think this nuclear strike will be limited?, i.e they will launch only a few missiles just to destroy DC because they will nuke you with the best intentions, not to annihilate you, but to give you a chance to strike back full scale? If yes, what do you think will be the reaction of the USA? Strike back as well only one nice missile on each countries capital? Or strike back with full force? If so, then what would Russia and China do when seeing those missiles heading at them? Once again, how could this be LIMITED??? The sheer number of warheads existing today ensures total annihilation, or how I am wrong in this? - or do you think that if they strike, it can only be a full scale strike, Defcon1, and there it is simple to find the total number of missiles and warheads of their combined forces. In that case, do you think anything in the US would survive such a strike? Follow up : we are losing momentum with this lack of strength around 1350. Besides, we topped at 1360+, which is pretty much another 62% retracement Fibonacci level of the 1430 - 1250 last downwards move (1365). If we stall Under this 1365-1370 resistance...pff...can be another round of down move towards 1300 $ once more. Conclusion : as I am not living from trading and I am in no hurry to make a profit every day with each of my trade, I put back my stop loss at the level I bought my long position. Yes, I am more likely to be stopped that way, BUT I am 100% sure not to lose any money. That's the most important thing for me. I won't let this crazy maket put a dent to my capital. Tight. Safe. Patient. My target was the median of the green pitchfork, crossing the Bollinger sup 100 period in a quasi range in this time unit, around 1410-1420 $, with a network of résistances. BUT it meant an acceleration above 1350. There is no acceleration. On the contrary, today we are stalling again Under the technical upwards support (short-term) of the last uptrend move, as you can see. So...not as optimistic about the potential as I was 3 days ago, especially with the CDUR up there having already consumed most of the impulsion's potential. Also, if I Watch the units this way : 2 weeks / 2 days. On the 2 week, the CDUR went down leading prices from 1800 to 1200. Now it's back on its top and prices just lateralized in the process...NO STRENGTH from the bulls!!! It is confirmed on the 2 days, once again with Bollinger Bands converging in Phase 4. BORING. As long as we don't get above 1365 at least and Bulls show some regular strength, there is not much to hope. I thought my target of 1400 + was modest enough. I may be proven wrong soon. USD is now bouncing hard off resistence and gold declining. I think Ben has a little surprise of his sleeve. Either way if no taper, or taper tickle, it's already been priced into the market for gold. The smart money is getting short. DBC and GDX still in a vicious downtrend. Exhibit "A" of a "Complete Collapse of All Collapses"
Zero inflation to be found anywhere, except for ObamaCare premiums. My other prediction is cause Bernanke took heat not tapering to everyones expectations last time, this time he might do it - again against the expectations of the market. This will test the viability of the market, will it be a complete collapse (unlikely) or just a knee jerk reaction. Royalty stocks getting pummelled again, RGLD down 4%, man, they love shorting these names. AAPL, GOOG, CMG, PCLN, NFLX, and other winners. JCP, SHLD, X, AA, and others. I will seriously consider liquidating everything though when (not if) this DJIA breaches 16,400. Where's this LINK at? I'd like to POST another pumper on The News UNIT. Thanks. What does swb in sparks mean? Another fresh, new, world record, closing high for the S & P 500. Stay in the system. Those who got out and liquidated their stock portfolios earlier this year are missing out on tremendous wealth building gains, never before seen in the last 10 years. But wait, "Any Minute Now, I Swear! !, the whole system is gonna blow!.." I put 1/3 of my cash assets into physical gold. That leaves a lot of room for profit and speculation as long as the party goes on. The 1/3 might prove very useful if a surprise dollar collapse should occur. Maybe you'll get some warnings about it. Maybe not. To those who are completely laughing at scenarios such as Sinclair's, ie great leveling then great reset, can they please prove why this possibility is so unrealistic, while governments are more and more giving hints that he may be correct? home sales biggest drop in 40 months despite Fed being biggest player in the market of the most important sector of the economy...that plus the excuse of the government shutdown, - these two reasons i believe will force no taper tmrw...the only thing doing well are these new record highs due to all the cash pumped into the large financial insitutions...they will not take that away....if gold and miners bounce, could be pretty significant little bounce past important levels, like gold 1375, etc. "Central banks are on track to cut back their gold-buying by 34% in 2013, according to forecasts by metals consulting firm Thomson Reuters GFMS. The retrenchment follows two consecutive years of rising purchases, according to the IMF." This includes Russia. The good news is we must be nearing a bottom if they are selling. Central banks never get this right from what I hear. Interesting. I believe it was Armstrong who said a gold rally cannot begin until headlines appear that say "Gold is dead"
However..I think this is the end for gold. Some CIGA's are losing their patience and are becoming rather annoyed with the outlandish predictions which never seem to happen. Can't blame these guys, many are now finding out that they have been bamboozled. 1. You keep talking about the "Great Levelling" before the "Great Reset." The problem is you also talk about QE to infinity. How can you have both? The more they print the more this goes on, right ? It may take another 50-100 years! Can’t they just "reset" everything? 2. Hyperinflation. You’ve said this before and each year it gets extended out. Granted we most definitely are seeing higher prices in food and services particularly in Australia and New Zealand including large increases in property values. People are making a lot of money in real estate so what’s preventing this from continuing? Should one be buying real estate in our countries at this point in time. I have a house that is paid but we are tempted to buy another one with a lot of land but that would mean a mortgage. Is this advisable? What would you do in my position ? 3. GOTS. Jim, please… surely this doesn’t apply to the whole world. For the system to break down would imply chaos. Since when has the world been thrown into chaos since the Second World War? 4. Timing. The clock keeps ticking Jim and the years role by. What makes you think things are getting to boiling point? I look at crooks like Obama and Camron but they don’t look worried in the slightest. Would I be right in saying they have an agenda ? John Williams from shadowstats is also been calling for hyperinflation since like 2008, definielty since 2010. And here we are going into 2014 - which will be the year for hyperinflation according to him. Why do you put the questions without the answers? Looks like a nice morning rally for gold, guess due to ADP numbers not being up to par. However we saw a strong dollar and weak gold yesterday at the start of the FOMC meeting - might that have been a leak on what direction the meeting is going. Or was today's action more indicitive of the direction of the meeting and not too much to do with ADP numbers. Guess we'll find out in a few hours. I have no definitive idea of the direction of the dollar or gold right now. It is trendless in the big picture. Why do you expect something so big out of a meeting where they are stuck with little data. If the hawks on the Fed want to flap there jaws about tapering in a few days it will mean nothing. They don't want yields in the ten year spooking the markets again. Here we go again. Royalty mining companies getting pasted again, juniors now crashing back to the lows, bigger cap companies like NEM down to the bottom of the trading range and now within a few bucks of 5-year lows. Looks like all the high flying stocks on the NYSE are getting dumped en masse, and as usual, anything gold related will get sold off 3x faster. The mighty U.S. Dollar is now going completely vertical, however BitCoin is barely moving off its highs, still at $212. Just another day in the office, everything is so predictable, the Fed's transparency is making it so easy for speculators to trade because the same action happens over and over again. Mark and as always your virtual portfolio is still the same. Unchanged. Looks like the run up in gold priced in the no taper. While the retailer is buying cause they will continue the 85/B a month the institutions are going short - lather, rinse, repeat.